Ordered this watchbox for my husband as a present for him dealing with me while I was pregnant :) I joked it was his "push present", as in he didn't push me over the cliff! LOL. He LOVED the box so much and shows off his collection anytime we have guests. The watchbox is so beautiful crafted, (I was drawn to the blue pattern detail on the pillows) it truly is a show piece in itself. I had it engraved with his initials to make it even more special. Seriously, such a great timeless gift to give someone. 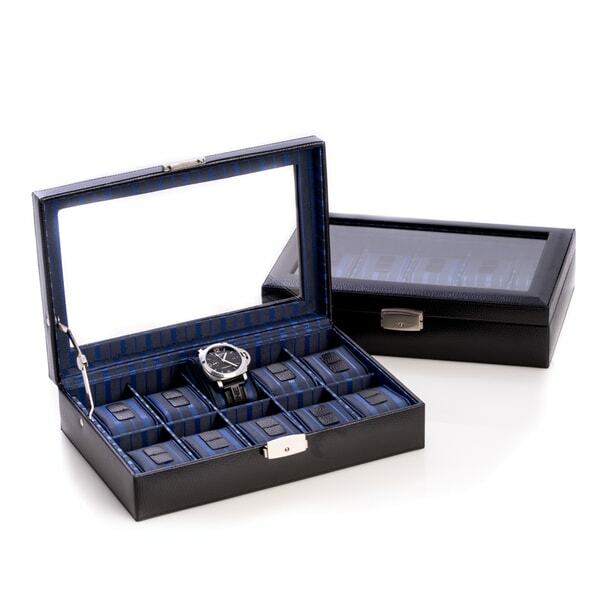 The 10-watch case features a glass-viewing top for showcasing your timepieces and a convenient locking clasp. The exterior is constructed of genuine leather, while the interior is lined with soft-velour to protect your watches against scratches. My wife and kids got me this gift for my birthday and it was fantastic. I am a watch fanatic so it was perfect. Very useful, clean and keeps my watches in an organized place. Will definitely be recommending it to my friends and family. Purchased it for my brother as a graduation gift. Thought it had a little more character with the blue interior and rich leather. The item COMPLETELY exceeded expectations - brother loved it, now I want one. I returned. Glue marks where the leather was glued together at the seams, the pillows are made of cheap fabric. To store and protect our watches. The color of the interior is unique and attractive.